How to Download Videos from YouTube and Extract Audio/Songs/Ringtone for Nokia? The Internet popularity promotes the development of online music videos. Now it has become amazingly easy to get music videos online for entertainment. Sometimes, we may want to extract a song from a music video. Now, let me tell you how to achieve it step by step. Log onto YouTube.com and search the music video first, as shown in the screenshot below. Below is one of the search results. Enter the page and you will get the URL from your browser, as shown in the screenshot below. output format includes: AVI, WMV, 3GP, MPEG-4, MP3, FLV, etc. After installation, launch the program. Click “YouTube” button, as shown in the screenshot below. 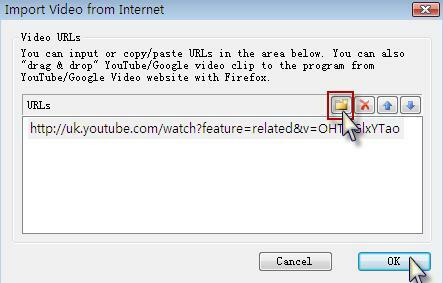 Now, copy the above-mentioned URL of the music video and paste it into the form of the pop-up window, as shown in the screenshot below. After that, double click the bar to download the video from YouTube. Select the video when completed. When completed, click “Folder” to get the music. Done! Last edited by steaner; 12-14-2008 at 11:46 PM.